Takeaway: DoD's topline for FY 2019 is a foregone conclusion but breathtaking in its aspiration. It still isn't enough. With a truly significant increase in funding for FY 2018 in hand, the Pentagon has begun its advocacy of the FY 2019 budget proposal to maintain that fiscal momentum. The FY 2018 budget topline was a full 10% above FY 2017 spending authority which was already 4.5% above the level authorized for FY 2016. Congress amended the Budget Control Act for two years so we know that the FY 2019 DoD budget will maintain the FY 2018 level of spending with an incremental 2% increase to account for inflation. The chart shows DoD budget authority trends and the current law in solid lines and in dashed lines what the Administration is proposing through 2023. 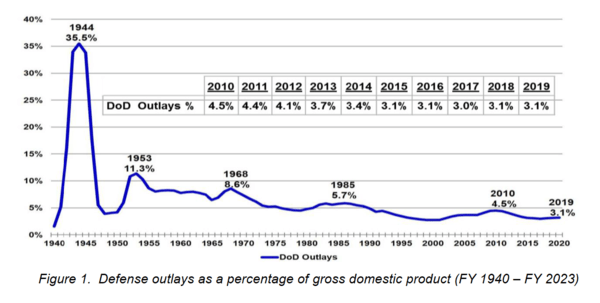 While the FY 2019 DoD budget request is "flat" in terms of growth compared to the FY 2018 appropriation, the proposed change in the long term cycle of DoD spending in historical terms is stark. 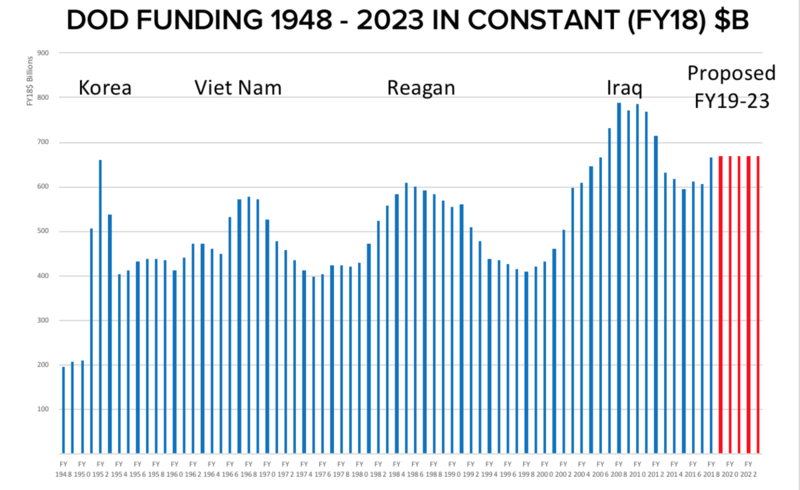 In constant dollar terms, the Trump Administration intends to outspend the Reagan era of defense spending. The chart shows that maintaining the 2018-2019 level of spending in constant dollar terms for five more years would be unprecedented. While he should be confident about getting his desired topline in FY 2019, (the change to the Budget Control Act authorizing it is already law), SecDef Mattis has been laying the groundwork for a robust long term budget for some time. In its budget rollout in March, the Pentagon noted the debt of investment shortfall that has developed since 2011, clearly stating that 2018 and 2019 spending levels only begin the recovery. In his testimony to the House Armed Services Committee last week SecDef Mattis noted that the country can "afford survival" putting the defense budget in terms of % of GDP. We are frankly skeptical. The Pentagon is only now, six months into the fiscal year, receiving its FY18 funding. 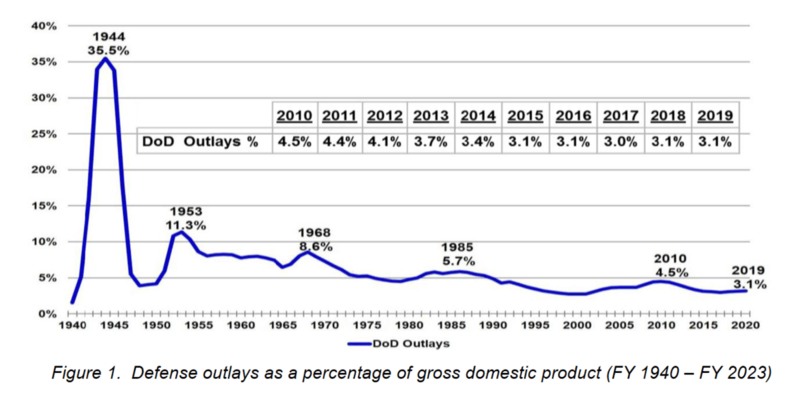 The long promised bump in defense budget authority is only good for two years and comes only after a year long battle where the Congress and White House are of the same party. Just 17 months from now, Congress must repeat this ugly process in an even more difficult landscape. 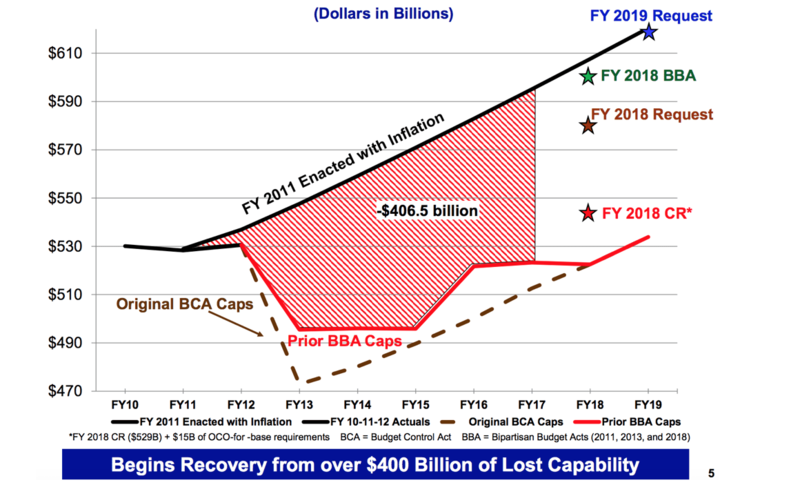 The gap between accepted Pentagon recapitalization plans and the Budget Control Act will be at a record $130B (see chart above). Changing that law will be in the hands of a House that will have flipped, a Senate that will be close to flipping, under a President at increased risk of impeachment. The economy is likely to have slowed and we will have the first of several $1+T deficits. Short of war and despite the "affordability of survival", we find it difficult to see the long term sustained budget support for DoD envisioned by the Administration.